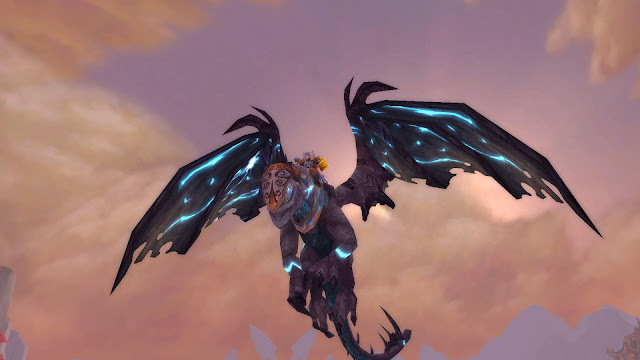 Wow Insider has a post up about collecting dragon mounts, while it was aimed at the warlock class; it is still a neat list for accessible dragon mounts in the game. The easiest IMO would probably be the timed Caverns of Time (Stratholme) mount. But if you want a flashy newer model, there are some that are pretty easy to get at 90. I had completely forgotten about some of these mounts! I remember I had wanted a few of these but they never seemed to drop when the content was current. There are two in particular that drop in regular or heroic runs- Stone Core and Vortex Pinnacle. At 90 these are easy to run. I gave the one in Stonecore a few tries but I really dislike that zone, the whole area outside has never been one of my faves, so oppressive. Then I saw that I actually liked the dragon better that drops in the Vortex Pinnacle, I figured I'd focus on that one instead. It is a lovely grey dragon, one of those spiky models, with pale blue lightning shooting through it. Very snazzy looking! The instance is quite easy at 90, on regular you can breeze right through. If you can stealth, you just sneak through to the bosses if you don't want to do much. I get lazy sometimes and sneak through some of these on my hunter. If you have a tabard for reputation though, you might want to slap it on and get some faction while you try for mounts. I got extremely lucky as the mount dropped on the first try. I was crossing my fingers but I didn't expect it to drop right off the bat, that was a good feeling. Some mounts have evaded me for years, so this was a nice change. Such a gorgeous mount (pictured up top). So if you're looking for a flashy dragon mount, there are some options to chose from with different colors, check out the article linked at the top. I also managed to get one of those maggot (hunter) pets. We really need more stable slots!!!! I have been reading about many hunters grabbing them before patch 5.2 hits. Supposedly in 5.2 you can no longer tame this pet. 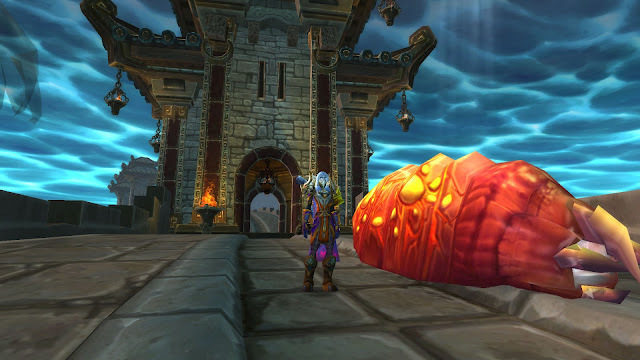 These things are huge once tamed, when they spawn (as minions) they are tiny. I wasn't all like 'OMG I want me a huge maggot pet', but if the pet will be untamable in the future, well, I might as well grab it while I can. It is always cool to have a unique pet. The only one I've ever gotten was the spirit wolf back in TBC. Now you can tame the spirit beast version (Cataclysm), but you have to be Beast Mastery to use it. I still have mine and it is not a spirit beast, though I do want the spirit beast version too, mine is just a regular beast so I can use it with any spec, which is kind of cool. I've become really attached to spirit beasts though, I have a macro set up to heal myself with the heal they have, comes in handy in a pinch. Anyhow, I'm not sure if 5.2 will hit today or not. If it doesn't then you might want to grab one of those big fellows. As of now-they are not rare. But, it looks like when 5.2 hits they'll be pretty rare as you won't be able to tame them again. There are two colors, you can see them here on Petopia. I picked the red one, then I named it Slimy.